Digested AmilCP part. Ran gel. Lane 8 below (key on the main page is wrong). Appears that previous step was not in fact the desired product. GG. Executed analytical digest on KILD (Bam and Eco). 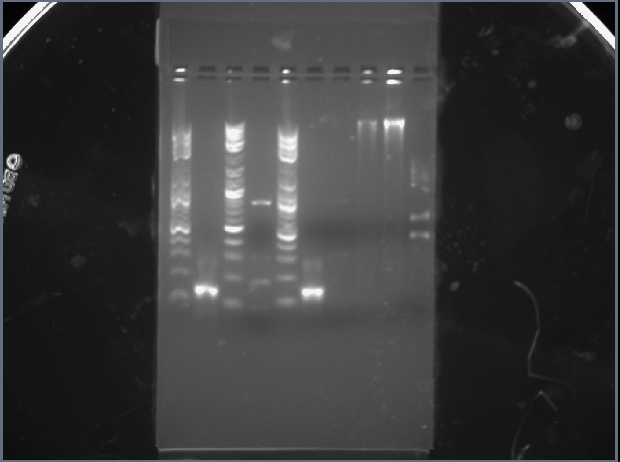 Ran gel on Miniprep and JWA6-2 (most recent AmilCP product). Lanes 3, 7, and 10 below. KILD lane empty. AmilCP lanes MIGHT contain correct part. Proceeded on assumption that they did, due to lack of time to repeat steps. 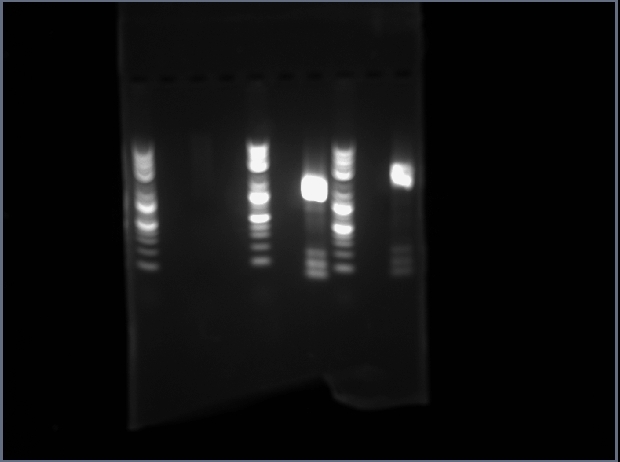 Ran gel on all AmilCP PCR tubes to check that they contained what I thought they contained. All JWs below. 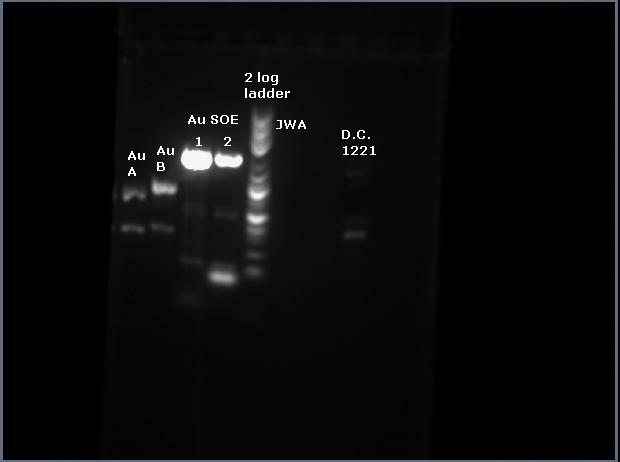 Determined that JWA5-1 did contain the correct band and that previous gels had been read incorrectly. 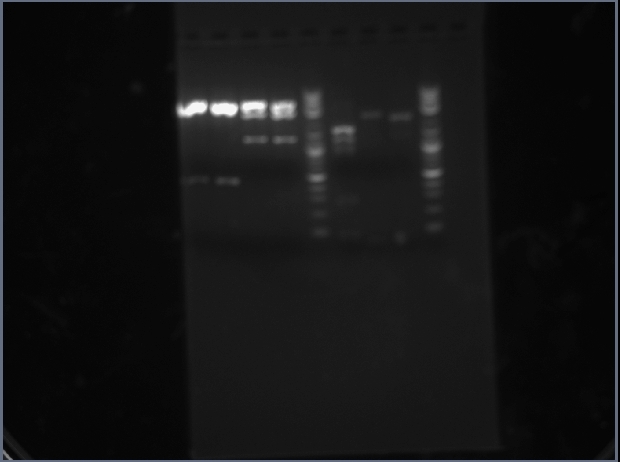 Began setting up PCR to amplify, but in the process screwed up another Zymo and washed out the only A5-1 I had left. 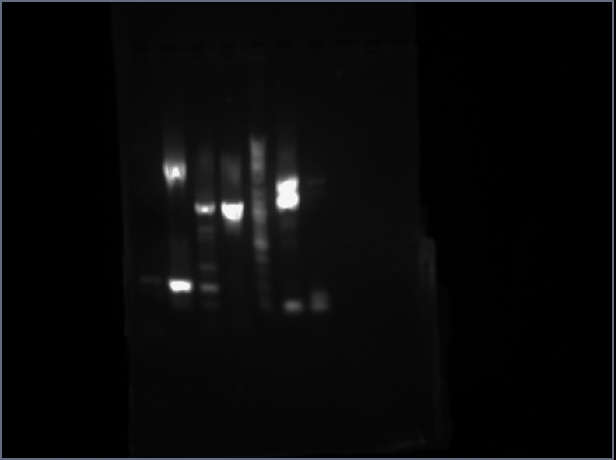 Set up another PCR2 on previous step. Ran Zymo on PCA1 products for KILD. Set up KILD PCA2. Made note to design analytical digest for the one successful KILD miniprep. 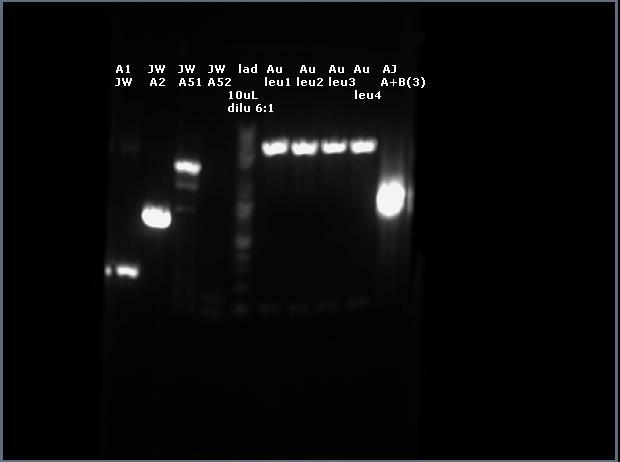 Ran gel on AmilCP PCR product. Lane 7 below. 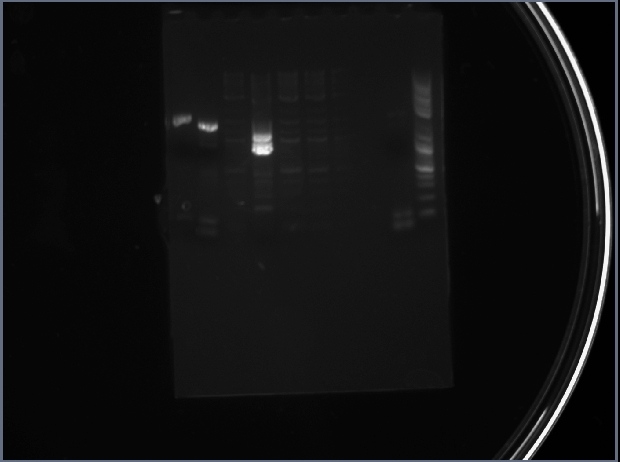 Ran gel on the pre-PCR2 AmilCP parts to double-check contents. Lanes 4 and 7 below. Fragments appeared to be correct. Set up second PCR again. Cleaned up KILD PCA1 products. Screwed up Zymo procedure. Attempted to salvage and re-cleaned. Screwed up again. Cursed loudly. Set up PCA1 for KILD. 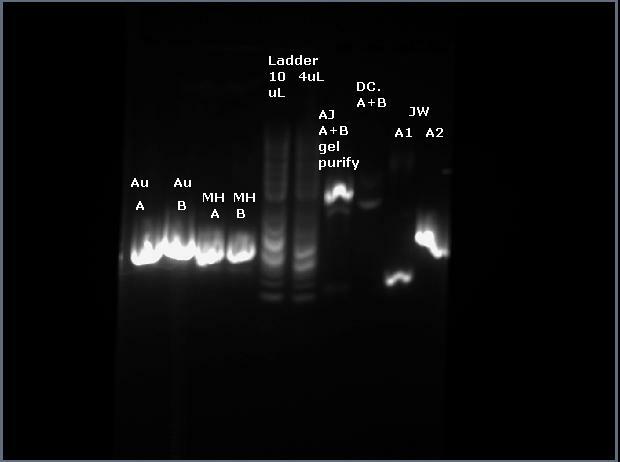 Ran gel on AmilCP PCRproduct. Lane 9 below. 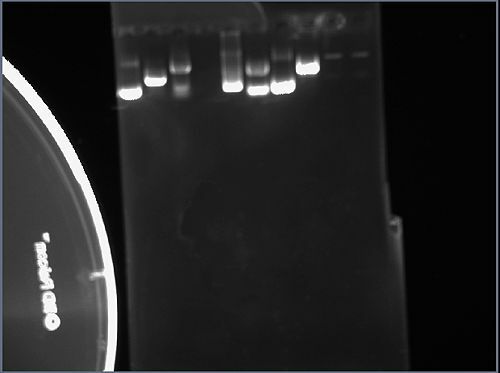 Set up digestion on AmilCP parts while gel was running. Discarded - PCR failed. Finally got a white colony of KILD. Miniprepped, then ran out of time. Small Frag Zymo purification on AmilCP PCRs. Checked KILD colonies; nothing grew. Picked a 3rd round. Restarted KILD. PCA1 on o1, o2, o9. Started miniprep on KILD. Colonies were all "secretly" red. Re-picked. Ran gel on AmilCP. Lanes were completely empty. "JWA" below. Add 180 uL of Zymo ADB buffer (brown bottle) to a 33uL or 50uL reaction. spin for 90 seconds, full speed to dry. OpenWetWare crashed shortly after I started the Zymo; without physical copies of the protocols (I knew I should have printed them out, urgh), no further progress was possible. 3.3uL 10x Expand Buffer "2"
Add 100 uL of Zymo ADB buffer (brown bottle) to the reaction. spin through (15s), discard waste. 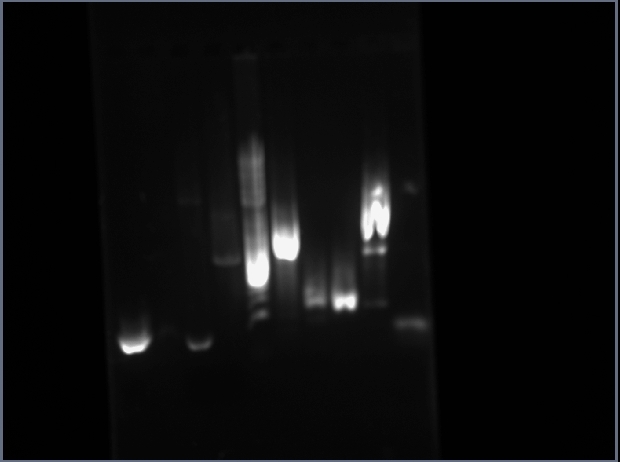 Small Frag Xymo on the gel purification product from last time (since the promoter part is considered a small one). This page was last edited on 27 March 2012, at 21:11.